Slate Herman knew it was a possibility. 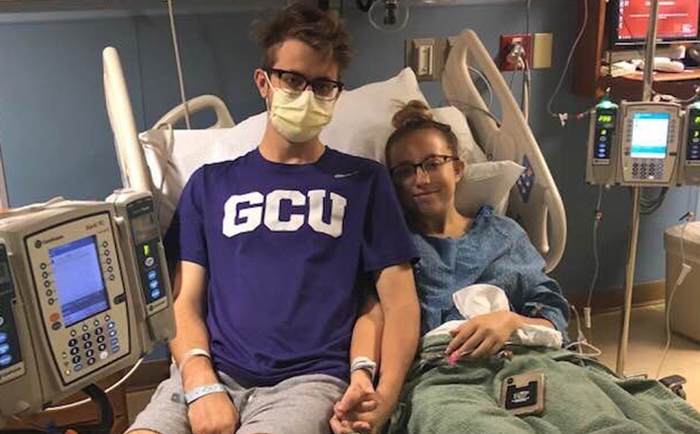 He talked about it with friends during his time at Grand Canyon University, how his father, Travis, died of cancer when Slate was 10 and his sister Hope succumbed to the disease two years later. But he was banking on one very important factor, discovered in his DNA testing. “I don’t have the gene,” he said. Slate Herman and his sister Isabelle both were diagnosed with cancer at about the same time and have had hospital rooms right across the hall from each other. 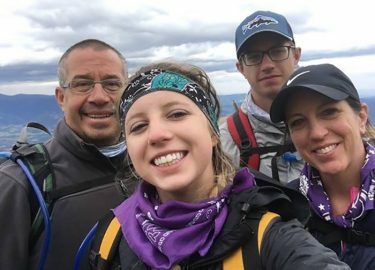 So he was doing what young people should be doing: He was living life, and he was living it extremely well – he was president of the Associated Students of Grand Canyon University (ASGCU) before graduating in April 2017, then went on to law school at the University of Colorado. He didn’t think too much of it when he felt fatigued while walking to class. “I thought I was in better shape than that,” he muttered to himself. But just to be sure nothing serious was going on, he had some blood work done. While at the birthday party for another GCU graduate, Thomas Rotering, he got the fateful call. Come to the emergency room immediately, said the voice on the other end. We found something. They ended the party right there and drove him to the hospital. “It was kind of out of left field for me,” he said. The diagnosis came three days later: acute lymphoblastic leukemia. Cancer had struck the family again. But, incredibly, it wasn’t done. 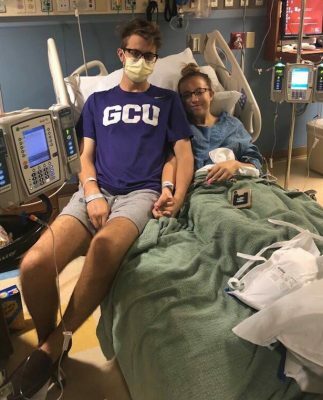 His sister Isabelle, a student at Liberty University, flew back to Colorado to visit him, and then she didn’t feel well. A week later, she, too, was diagnosed with cancer — same thing, acute lymphoblastic leukemia. In a cruel collaboration of fate and convenience, she was given a room right across the hall from his at Presbyterian St. Luke’s Medical Center in Denver. Probably no one at GCU was more shaken by Herman’s diagnosis than Cody Dumas, who preceded him as ASGCU president. Herman was Dumas’ vice president, and their friendship is such that Cody had just seen him a few weeks earlier. He then went back to Denver to visit Herman in the hospital. “It was kind of surreal,” Dumas said. “It was one of those things where you hear about it in the news or on TV. It happens to someone you really care about, and it all becomes kind of real. It was hard. The reaction, and the positive message, was the same as word spread across campus. Herman said he was gratified to hear from so many people in ASGCU, Student Engagement and Spiritual Life. Everyone on the Spiritual Life team, for example, sent him a card, and Dumas delivered a GCU gnome on their behalf. The family in happier times (from left): Justin, Isabelle, Slate and Diane. “GCU’s support has just been overwhelming and all-encompassing,” he said. Said Dumas after visiting Herman, “He’s in really good spirits – really positive. We talked and laughed the whole time. It was like nothing was wrong. Typical of Herman, he has found a bright spot: His mother, Diane, and stepfather, Justin, are missionaries to orphans in Guatemala, where they were living with his younger brother, Max. The need to be there for Slate and Isabelle has reunited the family. So life goes on, even in these weirdest and most challenging of times. Herman recently finished his first round of chemotherapy and started Round 2. 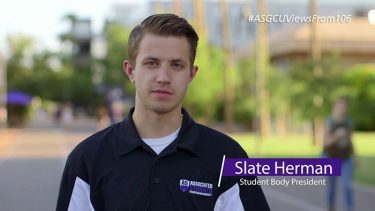 Slate Herman during his days as ASGCU president. Yet even though he has his good days and his bad days, he still sounds like the same guy who earned so much admiration for the even-keeled way in which he served as ASGCU president, never trying to wrest control and always trying to empower. Herman is taking a year off from law school, but he’s determined to go back. It’s that positivity that still stands out to Dumas. He isn’t the only one at GCU. It’s like one of those “It’s a Wonderful Life” lessons: Every life touches so many other lives – and the shame of it is that sometimes it takes a personal crisis to find out how much you accomplished in one place. Like George Bailey, Slate Herman has been reminded that when it comes to his legacy at GCU, he, too, is the richest man in town.